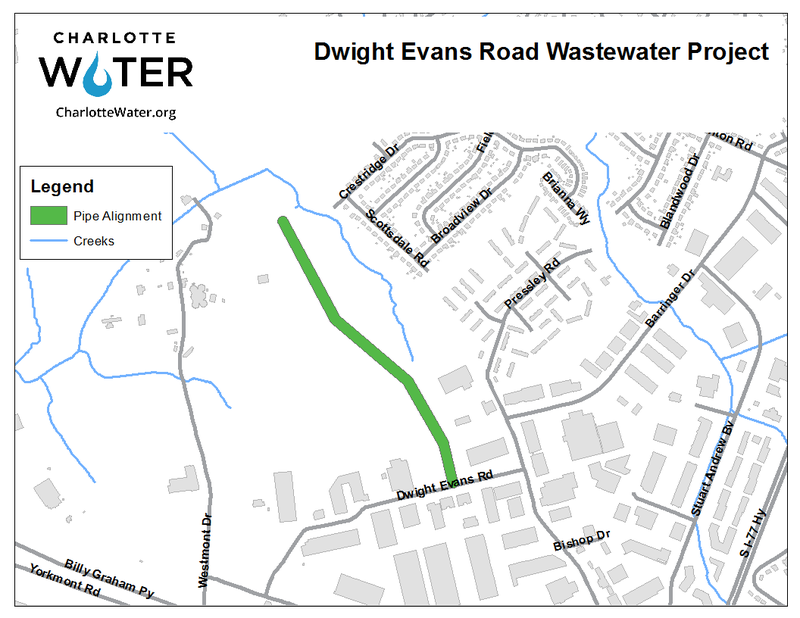 Charlotte Water will extend the wastewater pipe beside an Irwin Creek Tributary to Dwight Evans Road (between 1001 Pressley Road and 4700 Dwight Evans Road). Dwight Evans Road may be temporarily closed and motorist detoured when construction is under Dwight Evans Road. Customers will be notified via door hanger, Nextdoor, and email. The project includes restoration of affected areas including sidewalks and roadways. Lane closures may be required daily in coordination with CDOT. CLTWater works with CDOT and NCDOT to minimize traffic disruption. CDOT permitted road closures are posted here. ​Extend service to a customer on Dwight Evans Road.